Between Core Set 2019 Open House and Prerelease, 43050 players have played Magic in a WPN location for the very first time. That’s an encouraging number, but it’s not the one that matters most. The number that matters most is how many of them come back for a second. Enter Magic League. The Sealed format creates an equal playing field, where new players can jump in without committing much time or money, and get acclimated at their own pace. It’s the best second event for new players. You’ve got two ways of protecting the integrity of your league: use deck checklists, or keep decks in the store. Do the second one. It’s just simpler. The collection boxes even have a space at the top for names. League is a casual event—making players meticulously record their league pools doesn’t exactly scream “casual.” Deck checklists are a chore and most people don’t cheat, so let’s not punish everyone for the few who do. Ultimately it’s your call, but consensus says retaining decks is the way to go. 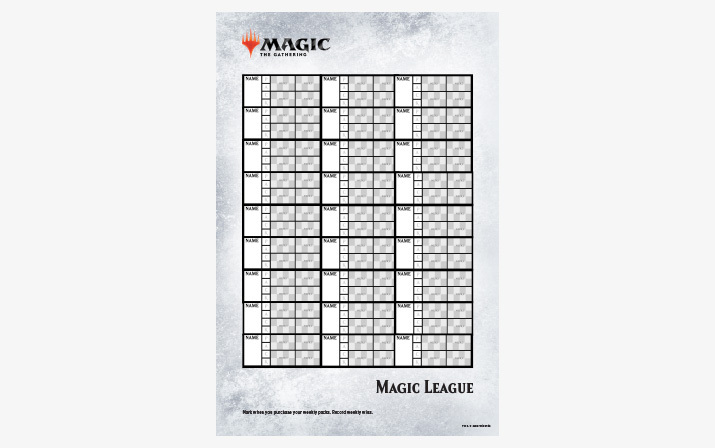 Magic League is an invitation to the habit of in-store play. After League, new players need clear direction on where to go next. The best option is Friday Night Magic. League is a kind of rehearsal for FNM—it's one rung up in terms of competition. Plus, you can offer limited formats to help kickstart their collection, or Commander, which players can start with just one purchase. Option two: a lot of stores simply extend their league, or begin a new one. League fills a need for a certain kind of player—the kind that hovers around the edge of organized player—and many of them will be perfectly happy where they are. Great. If League is the right fit, give them another League. For more ambitious newcomers, you might suggest Standard Showdown. The obvious caveat here is to set expectations: they're going to encounter players with much more experience and much larger collections. Take care to mitigate the inevitable losses. League’s primary goal is to get newcomers into the routine of playing in your store. Your odds of achieving that goal improve when your league is the only place to do so. First, avoid scheduling your league meetup at the same time as other casual events. Second, avoid scheduling it at the same everyone else’s. If the store down the street is running something aimed at the casual crowd—not just other league meetups, but anything casual—do your best not to split that audience. Most WPN events are self-explanatory. FNM, Standard Showdown—you show up, you play Magic, you get some promo cards. But league is longer, with greater continuity, and a unique format. So you’ve got to find ways to reduce the friction. This poster helps. It condenses all league info—match records, packs received, etc.—into one place. Plus, it’s a simple and subtle way to advertise. M19 league is just days away, but it’s never too late to improve. Try these tips out, starting this Friday.